Located at the southern part of the city, Dover High School, built in 1967, was faced with a growing student population and an aging building. 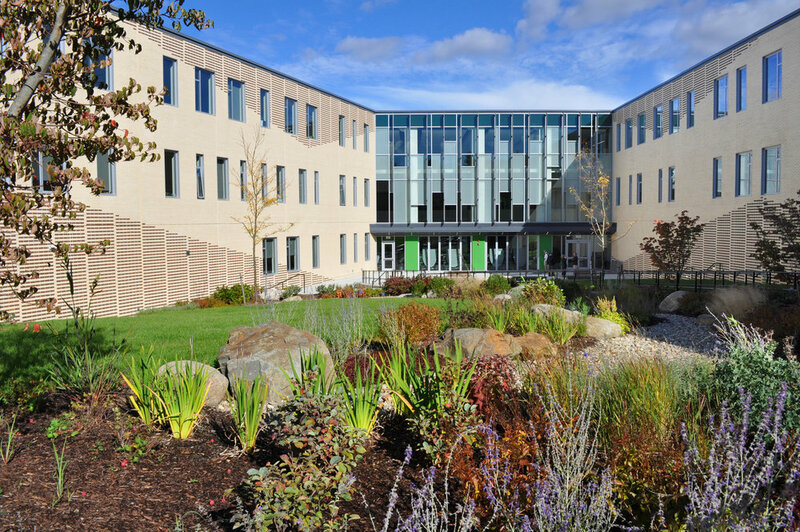 Halvorson Design worked closely with HMFH Architects to develop a pragmatic site plan that responds to the complexity of the school’s programming and reconfigures 2/3 of the 30-acre campus to accommodate the expanded building complex, parking lot, and sport fields. Designed to enhance the 21st-century academic learning experience, the new Dover High School complex also serves as Regional Career Technical Center to prepare/empower students with future career and technical proficiency. To allow for continuous student activities during the construction process, the new building is sited behind the existing high school. The entry experience was enhanced with a red maple tree-lined roadway and new sidewalk, promoting safe vehicular and pedestrian circulation. 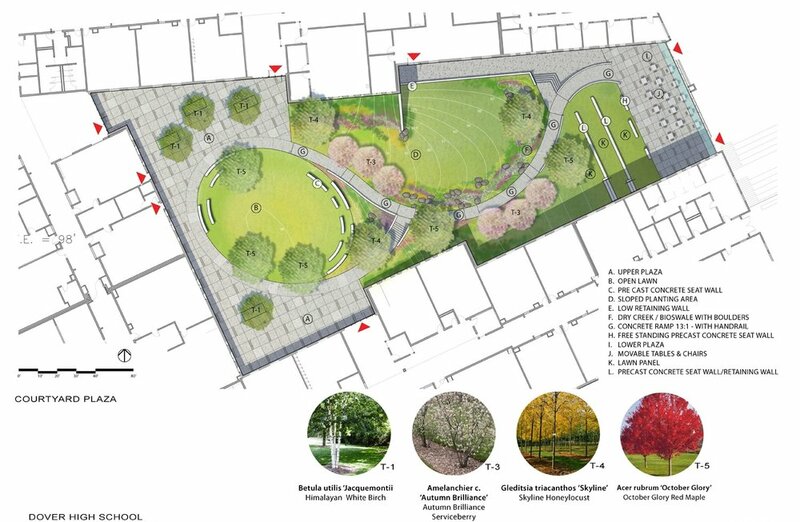 An accessible entry plaza overlooking the softball fields and drop-off/pickup area provides seating and colorful plantings to serve as a welcoming gateway to the school and a hub for social interaction and gathering. 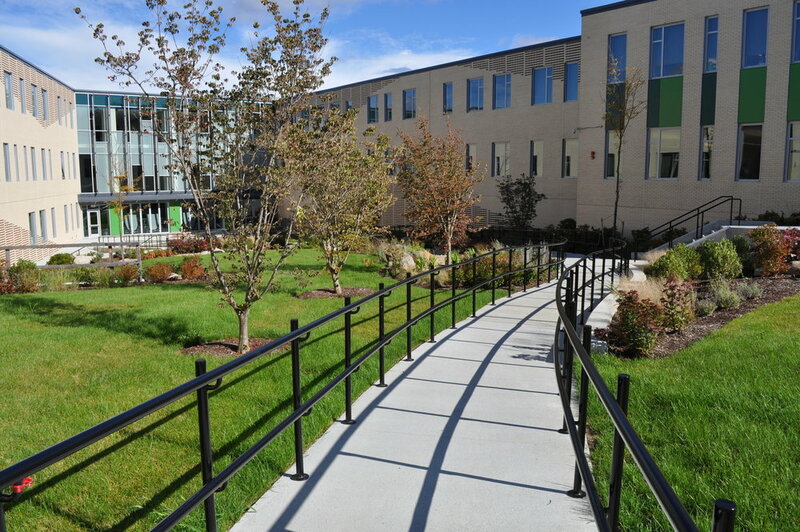 The Dover High School courtyard provides multiple opportunities and a new outdoor environment for gathering, reflection, and study. 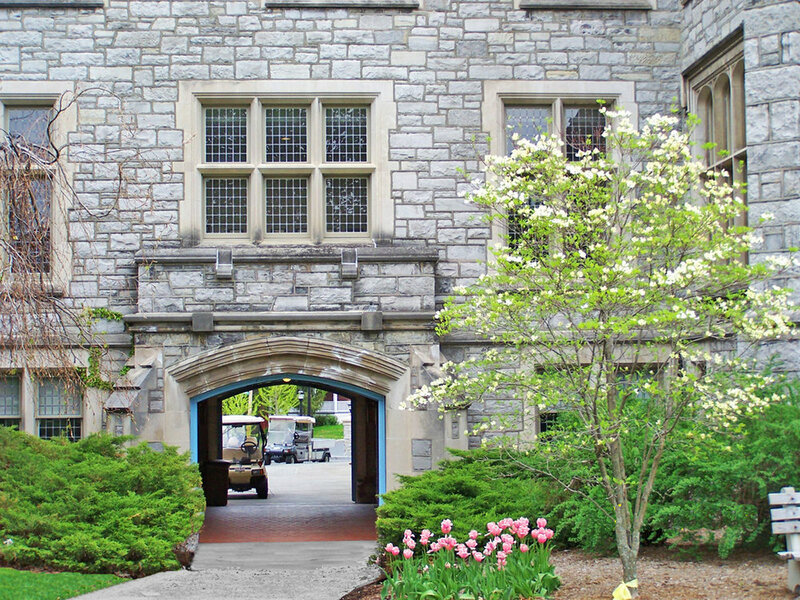 A dry stream with diverse plantings flows along the curvilinear ramp walkway to engage students with multiple sensory experiences and offer seasonal interest as they traverse from the outdoor dining area at the lower plaza up to the oval open lawn at the ground level. Terrace seat walls with lawn panels at the base of the gentle slope form amphitheater seating for outdoor classroom and performance events while the open lawn and paving area with benches framed by shade trees at the upper plaza create a flexible space for group activities and provide breathing room between classes for students.